If Microsoft is being coy about revealing Surface sales data, it may be for good reason. Early demand for the company’s first tablet is lousy. How lousy? Put it this way: If Microsoft really did manufacture three million to five million Surface tablets to sell in the fourth quarter, it’s going to have between two million and four million left over at quarter’s end. In other words, with Surface available for purchase only from Microsoft Stores — and those stores are few and far between — consumers are unlikely to ever see the device, which makes them far less likely to purchase Surface, particularly given its price tag. And with so many other tablets available, there’s not much reason to seek out a Microsoft Store, assuming there even is one in reasonable proximity. 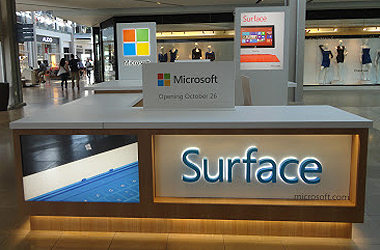 Currently, there are just 31 Microsoft stores and 34 smaller holiday kiosks in the U.S. Given that paucity of stores, the average consumer’s best chance of seeing Surface these days is on a billboard. That leaves Microsoft in a tough spot. Will the company stick to its original plan and continue to restrict Surface sales to its own stores, or will it expand distribution to other outlets in the hopes of clearing out inventory and spurring demand? Errata: An earlier version of this article said Surface pricing starts at $599.